An interlocking drum rug with a hybrid carpet and foam design. 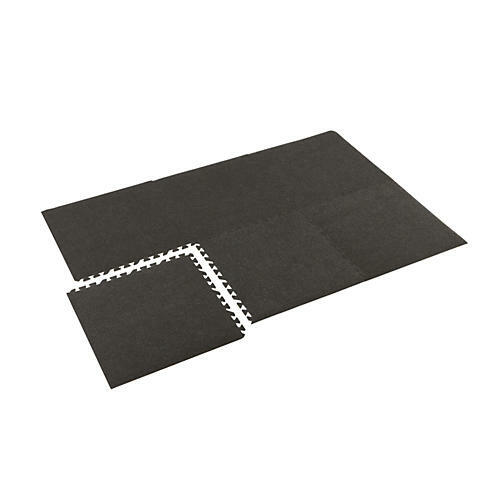 The easy-to-assemble Drumsetter Interlocking Drum Rug utilizes a unique carpet and foam hybrid design. The basic unit creates a 4' x 6' rug which is very light (just 9 pounds) and totally portable with a travel size of just 25" x 25" x 4-1/2". Plus it takes just minutes to assemble. Carpet panels can be cleaned with any upright vaccum. Have a extra-large kit? No problem, Drumsetters are available in larger sizes! Protect floors from scratches and keep your drums from stray movement. The edging is even beveled for a smooth floor to carpet transition. Includes nylon storage bag and as a bonus, an aluminum carbineer with drum key. NOTE: Drumsetters are not just for drummers. Keyboard, guitar and bass players will appreciate the foam cushioning that will relieve sore feet during those long gigs!